Silk is a special material and it´s a great hobby to paint designs on it directly. There is a technique developed for this kind of painting, that depending of what you are going to paint, it can have a very high level and complicated. In the ancient China, the fine fibers yarns produced by silkworms were investigated, and they began to be used to create tissues. For its quality, they soon triumphed, being a very expensive and luxurious material. Later, the island of Java was famous as a great center of the Batik industry. The silk is an elastic material and it lasts many years if it´s well maintained. Itcan be tensioned, painted, washed, ironed or cleaned and always retains its beauty because of its very resistant fibers. Chiffon:Transparent silk with very soft touch but difficult to tighten. Crepe de Chine: The silk that absorbs more paint. Jacquard: silk with textures and motifs in its plot. Douppioni o wild silk: more opaque than others, knotty and difficult to paint. It is used more for cushions or curtains. Raw silk: very white or toast, with enough texture and some specks protruding. You can paint on silk using: Gutta or Resist, thickener, watercolors and salt. The paints used are very bright, very fluently and transparency. Made with water, they can also be diluted and mixed with water. Before painting silk should be washed to remove sizing. Then, the fabric is ironed while still wet. 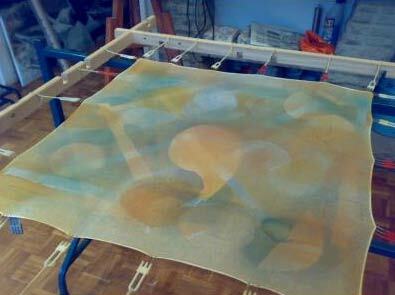 Ideally, prepare the fabric to be in suspension, as in a frame, so it does not touch other surfaces while being painted. To get duller tones and pastels colors we can mix with white. Technical of the Reserve or contour. You can use paraffin, hot wax or gutta. Paraffin and Wax are used in the art of batik. The gutta is a clear, thick substance that comes from the Indonesian tree called “Pallaquium”. The gutta controlled dispersion paint, tracing lines and maintaining separate areas. It is very important to do well these lines or areas to make the design more clear and not leave spaces where the paint is moved. Technique of salt. Expressive effects are made with salt (absorbing) on the still wet paint. Technique of the thickener. It is a transparent and denser than the gutta industrial product. Is mixed with paints to have thicker colors and can also be used to make reservations and barriers, leaving dry parts. Technique of anti diffuser or watercolor.With anti diffuser the fabric is prepared as in the normal canvases. Painting on silk with a frame. First we decide the theme and we make the basic drawing. We tense the fabric on the frame. We cover the whole fabric with the anti diffuser, with a brush or spray. We let it dry thoroughly. With the pen we draw on the canvas the drawing. It could also be traced or not do the drawing with markers, depending on the drawing we are going to do. We start painting on the picture. The anti diffuser prevents paint applied to expand the tissue and allow us to control the paint. We let it dry thoroughly. Last step, we ironed the fabric to set the colors. 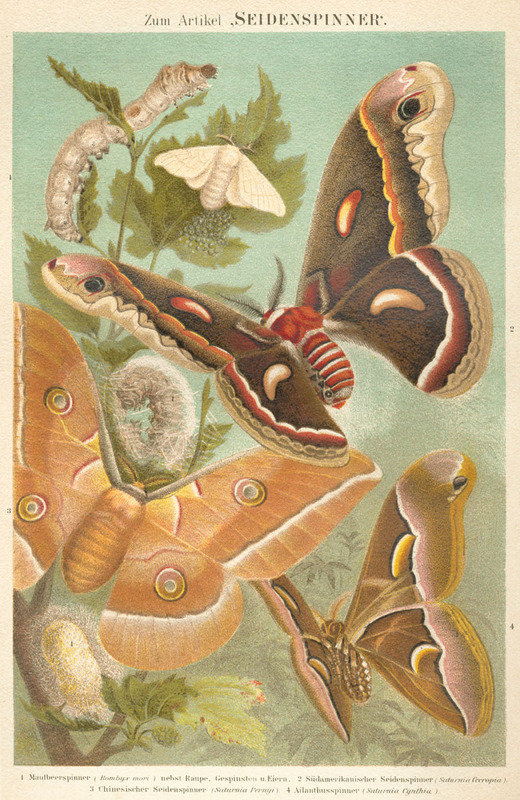 Source Wikipedia, painting on silk.